Eva A. Dalton, 93, died Thursday, April 11, 2019 at the Jennings McCall Assisted Living Community. Ann was born in Portland, Oregon to William Noble Rydalch and Ann (Hamlin) Rydalch. She grew up in the Laurelhurst area, attending local public schools and the Baptist Church in downtown Portland. She loved travelling around the U.S. by car with her parents when they were able to get away, and these adventures instilled in her a love of travel. Her father was a great swimmer, and through him began her life-long love of swimming. While in high school, her greatest wish was to study Chemistry at Reed College, which she did (despite consternation among fellow church-goers) and from which she received a B.S. degree. After graduating, she worked in a laboratory in California, then moved back to Oregon to earn a Master’s in Education from Oregon State University. While working as a teaching assistant, she met Charles Dalton, also a student at OSU. After receiving their degrees, they married and both began teaching careers in Bonanza, a small town in southern Oregon. They made life-long friends in Bonanza; but Ann hankered for something new. So, when in 1959 Chuck was offered a teaching job at Kamehameha Schools in Honolulu, Hawaii, they hopped on a prop plane with their two daughters and flew to that tiny dot in the middle of the Pacific. Ann taught Chemistry (and later, Math) at Punahou School. Ann and Chuck loved living in Hawaii and made great friends at Punahou and Kam schools. They added a third child to the family (a boy, born in the same hospital as Barrack Obama). When the children were older, they took them to Europe nearly every summer, gadding around on the cheap. Ann was in heaven. After the children had left home, Ann and Chuck divorced. 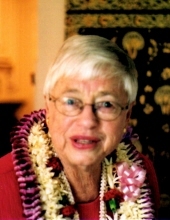 Ann continued to teach at Punahou till her retirement. The day after she retired, she hopped on a plane and spent the next year travelling by herself around Europe. Eventually, she settled back in Portland, near her daughters. While retired, she spent much time volunteering for Portland Rescue Mission, the Red Cross bloodmobile, the Washington Park host group, Store-To-Door and others. She truly enjoyed her volunteer work, she loved spending time with other people. She still found time to travel twice each year: east (to southeast Asia, mostly Malaysia) then west (Europe, mostly England, France and Greece). When at home in her condo, she continued to swim regularly (during the winter, and after she quit driving, she took Ride-Connection to an indoor pool across town three times each week) and would never have considered living anywhere that didn't have a pool. She swam often and read widely till the last months of her life. She died on April 11, 2019 at age 93 of heart failure. She is survived by three children, Carolynn Cohrs, Susan Dalton and Craig Dalton, son-in-law Lyle Cohrs and daughter-in-law Joni Dalton, as well as three grandchildren and two great-grandchildren. In lieu of flowers, the family suggests donations be made to the Salvation Army, 8495 SE Monterey Ave #9, Happy Valley, OR 97086, in Ann's memory. To send flowers or a remembrance gift to the family of Eva Ann Dalton, please visit our Tribute Store. "Email Address" would like to share the life celebration of Eva Ann Dalton. Click on the "link" to go to share a favorite memory or leave a condolence message for the family.